Greetings from Deep Creek Lake-Easter Winter Wonderland! Greetings from Deep Creek Lake on Easter Week!!!! Looking ahead a little when spring and summer start to show their face, consider getting your boat tuned up early before the marinas are swamped with service work. If you are looking for a boat, this is a great time to place your order to ensure getting the boat you want in time for the start of the season. Give Betsy’s brother, Adrian, a call at Deep Creek Marina 301-387-6977 with questions regarding a new or used boat. If you are looking for service, ask for Kim who will be happy to help you. Here’s a little teaser that I took before a morning session with Bets and the boys a few years back. Bring on summer! Don’t get caught in a stagnant rut & work routine and forget to enjoy life! LetDeepCreekLake and GarrettCounty serve as catalyst for this year being the BEST EVER for you and your family! Feel free to call me anytime with questions about anything here of interest to you. Check out this slope access homesite which is just a short pump with your ski poles from the slopes: http://vt.realbiz360.com/Listing-1265232.html. Happy Spring Break to you and your family! Posted on March 26, 2013 March 30, 2016 Author Bob HolcombCategories Betsy Spiker Holcomb Real Estate, Taylor Made Vacations & Sales, Weekly UpdateTags Betsy Spiker Holcomb real estate, Betsy Spiker Holcomb Taylor-Made Vacations and Sales, Children’s ski/snowboard programs at wisp, dawn patrol Deep Creek lake, Deep Creek Lake Activities, deep creek lake maryland real estate, Deep Creek Lake Real Estate, Deep Creek Lake Realty, deep creek real estate, Deep Creek Realty, skiing wisp resort, snowboarding deep creek lake, Taylor Made Real Estate, Taylor Made Vacations & Sales, wakeboarding deep creek lake, Wisp Resort, wisp resort skiingLeave a comment on Greetings from Deep Creek Lake-Easter Winter Wonderland! Rudy’s will be hosting their 42nd Annual Labor Day Sale in Wisp’s Lodge from Friday, August 31st through Monday, September 3rd and I can’t reiterate enough the savings you will receive on skis, snowboards, winter apparel, and the list goes on and on. I’m talking discounted warehouse prices on last year’s inventory. No joke! People who have experienced this sale before put it on their yearly schedule and are first in line to fill up their arms with mountains of winter sports gear. Questions call 301-387-4640 or email info@rudysatwisp.com. Check out the pricing/inventory below. Items are first come first serve, limited stock for sale, 6% tax on all items sold, equipment is rental or demo and is sold as is with no warranty. Deep Creek Lake Ski Season Update. What an amazing weekend we’ve just experienced at Deep Creek Lake! The skies were blue and the slopes were nothing but corduroy. We couldn’t have asked for better conditions. If you think you’ve had your fill of winter, the last 4 days of sunshine will make you appreciate the exhilaration of spring skiing. The next time you are vacationing here at Deep Creek Lake, Maryland take a little time at dusk to drive around to the North side of Wisp Ski Mountain and experience some spectacular sunsets. Even during the day, the incredible views of the surrounding mountain ranges span for 30-50 miles. At nighttime, the skies transform into a kaleidoscope of colors that will leave you in a spiritual calm. Just a short distance from our home, we enjoy these sunsets atop Wisp Mountain on a regular basis along with our dog, Mali, who pounces us anytime the word “walk” is mentioned! This is a spectacle worth penciling on your next trip to Deep Creek Lake!!! Visit www.DeepCreekLakeProperty.com for an up-to-date calendar of Garrett County happenings. Skiing-Deep Creek Lake. After going through a very mild fall here in Deep Creek Lake, we finally had a significant snow event over this past weekend here on Wisp Mountain. Hopefully you have already had your skis and snowboards waxed and had the edges tuned up in anticipation of getting on the slopes to carve up some fresh powder. Wisp Resort hands down has one of the best snowmaking systems in North America and the temperature and humidity now are perfect for making champagne powder. 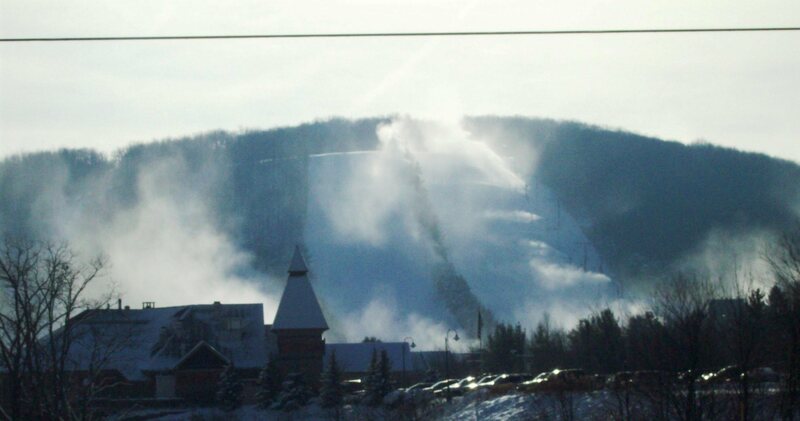 Although the skies have stopped snowing for the moment, Wisp Resort’s snow making operation is steady blowing a blizzard on the mountain getting ready for the grand opening on Friday December, 11th.